Dear Jeani the Genius of the Oven – I have tried mixing your chemical formulation known as Fig-Almond Upside Down Cake – Gluten-Free and just ate my first sample. Can’t wait for the second one! But I can only stand on my head so long, and it is hard to swallow that way. Is there an alternate recipe substituting Right Side Up for Upside Down? Ohhh…I’m dizzy. (But you knew that…). Living in northwestern Wisconsin, I didn't even know there was a fig season... or actually never thought about it! How wonderful to be gifted with figs! The cake looks amazing. Love figs and almonds. Yum! Thanks, Judy! I think of you when I post something gluten-free! That cake looks wonderful and I haven't made anything with figs for a long time. We had a huge tree growing up in Virginia. Thanks for sharing this great recipe! oh my goodness, that's divine. 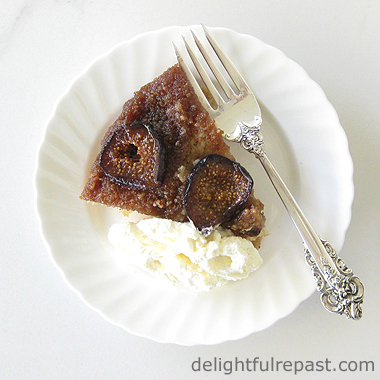 I do adore an upside down cake, I love how gooey they are and this with figs, gorgeous! mmm..figs..can't get enough this autumn fruit. This gf cake looks magically delicious, Jean. Bernideen, thank you. Reminds me, how I'd love to visit Virginia again. My paternal grandmother's family was in western Virginia for centuries, so I should visit that area. Thanks, Ida! I hope you'll try it soon. Angie, I actually thought of you when I made it! The way you always incorporate different grains and flours in your recipes. 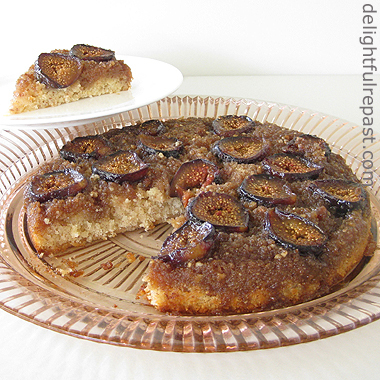 The fig cake looks delicious...when i get home I should try and make one.. Thanks, whiteangel. Yes, do make one soon -- it's pretty quick and easy! What a beautiful upside down cake! I love that you have made it gluten free, Jean. And how lovely to have fresh figs from your neighbours! Thank you for being a part of the Hearth and Soul hop. Pinned and shared! April, thank you for the hop and the pins and shares! Much appreciated. Next thing I make with figs is going to be fig rolls. Thanks, Amy! I love GBBO, though I just watch it on YouTube (AND I can't find Season 6 Episode 2, for some reason!). 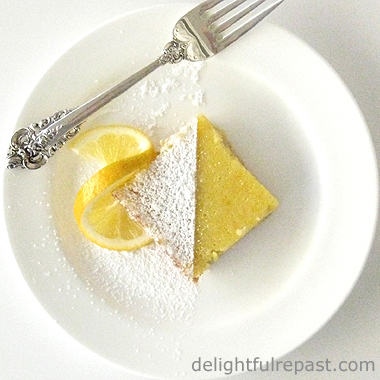 Thank you for sharing such a great recipe at the Recipe Swap. Thank *you* for the figs! Thanks, creativelyhomespun! I try to "hop" around every week, but I've been slammed these past couple months. Wonder how you moms manage to blog regularly! Is it me, or are upside down cakes so much more fun than the right-way-up kind? Maybe I just associate them with my childhood. I love figs - something I discovered relatively recently. I'm off to check out the other recipe, too. Pauline, I think so too! Much more fun! Glad you've discovered figs; they're wonderful. Thank you! I'm so glad you like it! I've never tried it with banana -- might be good! Can you get frozen sliced peaches? That I know would work well. Do let me know what you end up doing and how it turns out.